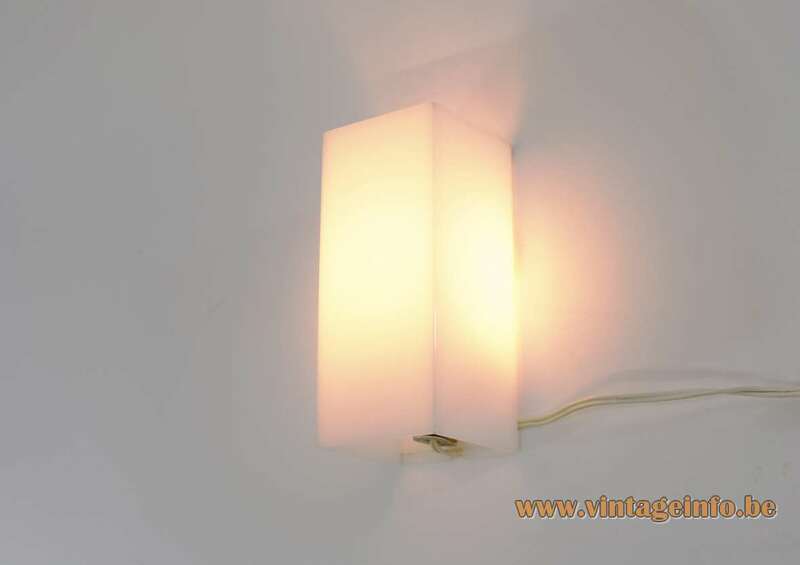 Materials: Geometric cuboid wall lamps made of white acrylic (polymethyl methacrylate), a metal part/wall mount and screw. Bakelite socket. Period: 1960s – Mid-Century Modern. Manufacturer: Sanka Oy, Loviisa, Finland for Oy Stockmann A.B. ORNO Metalworks, Kerava, Finland. Other versions: Also made in a long version and some variations. 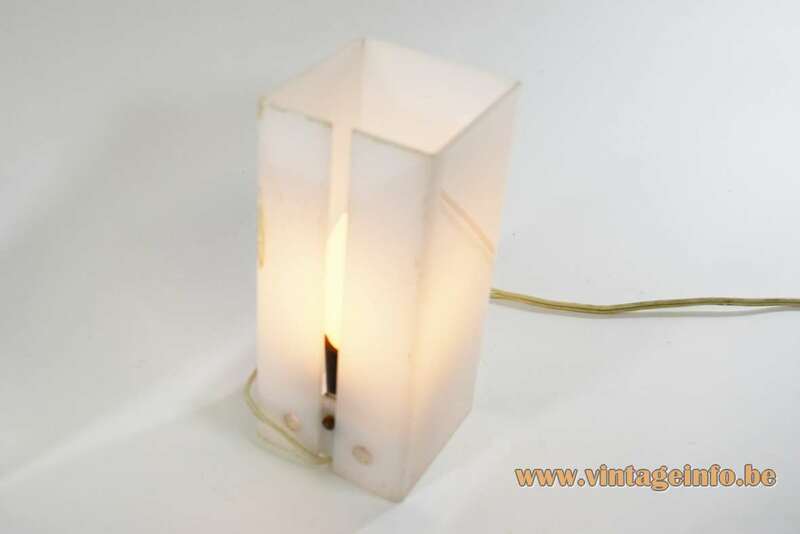 A comparable table lamp was also designed, as you can see. Yki Nummi was born on October 31, 1925 in China as a child of a Finnish missionary. Later on, he studied mathematics and physics in Turku and Helsinki and afterwards he studied design at the School of Applied Arts in Helsinki from 1946 until 1950. He worked as lighting designer for the Finnish Stockmann-Orno A.B. light factory from 1950 to 1975 and designed hundreds of light fixtures. 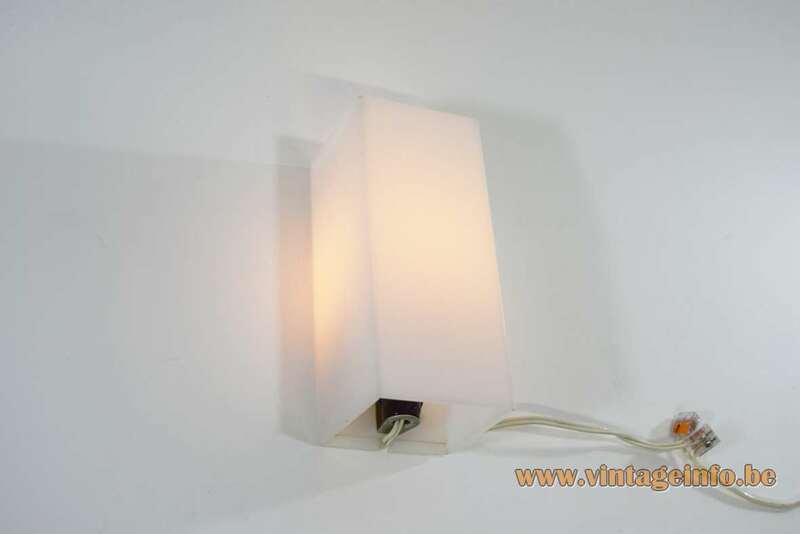 The best-known light fixtures are the Modern Art table lamp in 1955 and the Lokki (Sky Flyer or Flying Saucer) pendant lamp in 1960, currently manufactured by Keraplast and Innojok Oy (Innolux), both Finish companies. 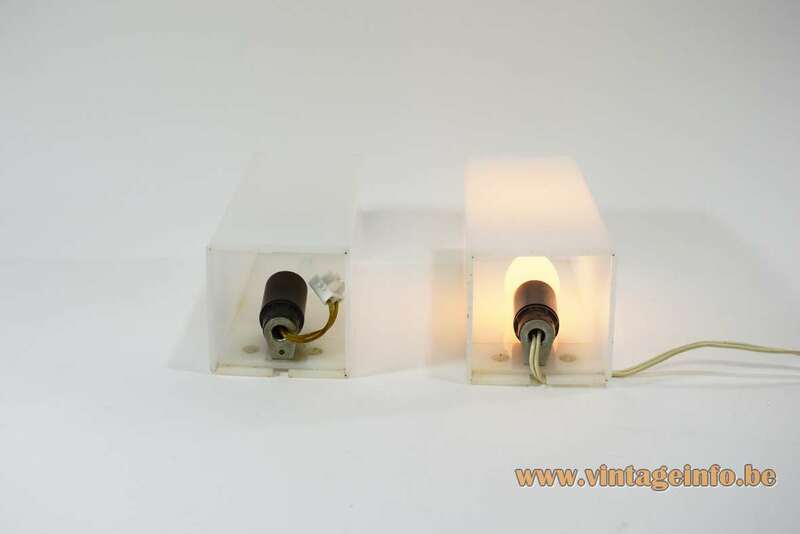 In Germany and The Netherlands these lights were until recent produced by Adelta. Keraplast and Adelta also produces the Modern Art table lamp. Keraplast has named it the New York table lamp. 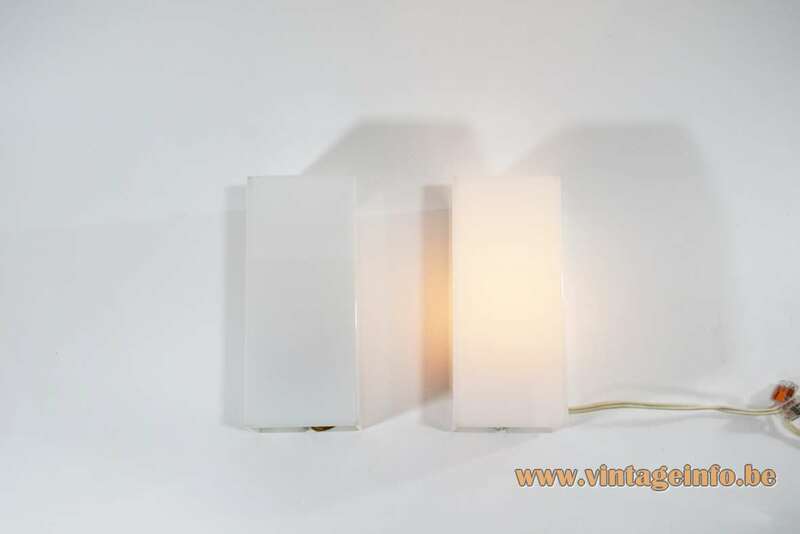 The Modern Art table lamp was acquired by the MoMA museum in New York, for their collection as a modern European Design Product of 1958, and that’s how the lamp got it’s name. Yki Nummi participated in a large number of exhibitions and fairs. His works were awarded gold medals at the Milan Triennials of 1954, 1957 and 1960. He received the Pro Finlandia medal in 1971. 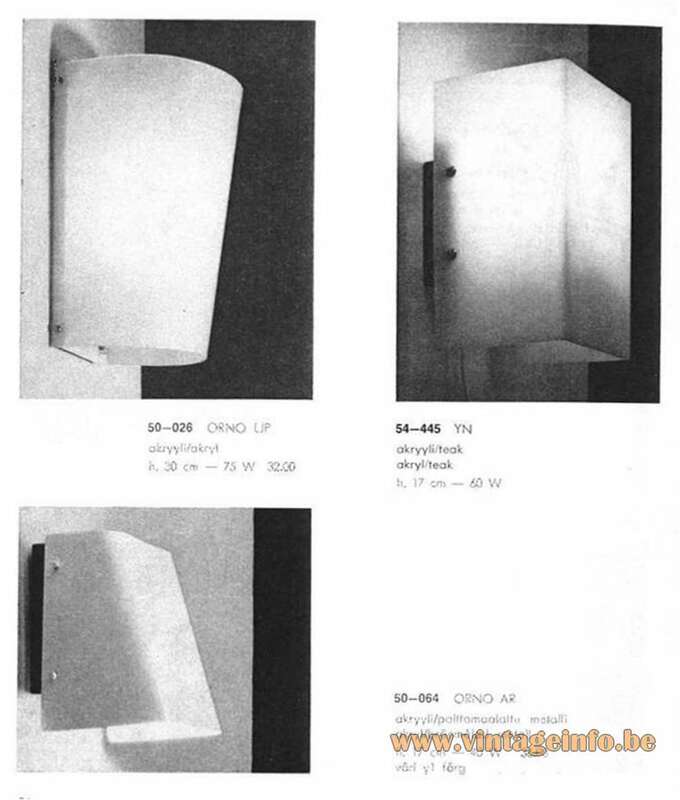 Nummi also designed spotlights for the world-exhibition in 1958 in Brussels, Belgium. Yki Nummi summarized his vision by saying ”People don’t buy lamps, they buy light”. Yki Nummi is deceased in Finland, only 58 years old on March 12, 1984. 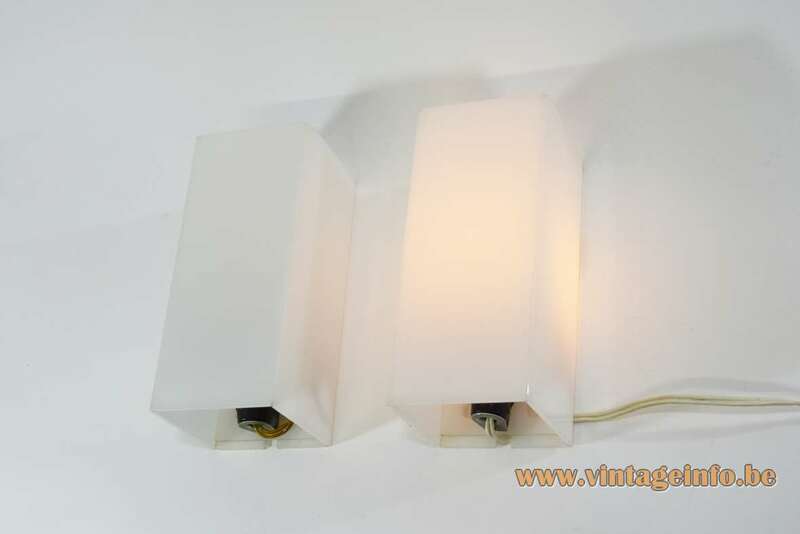 The acrylic lights of Stockmann-Orno were made by Sanka Oy, founded in 1950. The company focused on the design of acrylic plastic, which was a new material at this time. Sanka still exists but since the 1970s they produce showers. Stockmann-ORNO A.B. was a major lighting factory, founded in 1921 in Helsinki, Finland. In 1936, Stockmann became the owner of ORNO an the company moved to Kerava in 1937. 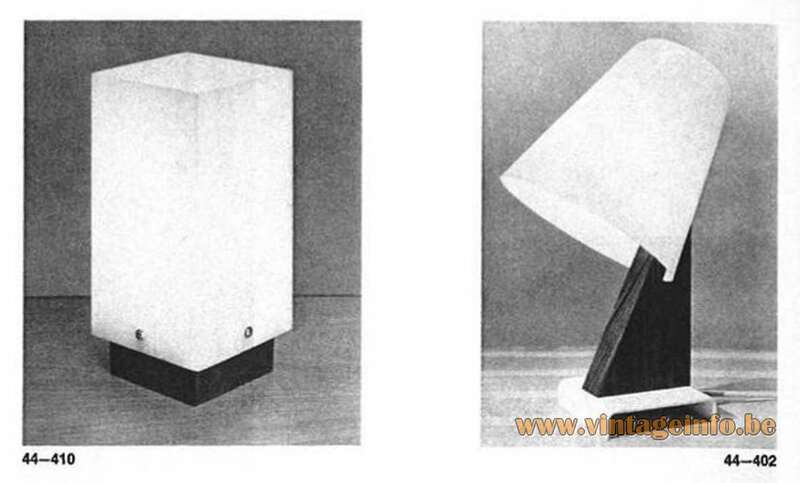 Before and during World War II the luminaires were designed by Bertel Lindholm, Gunilla Jung-Pircklén and Gunnel Nyman. From the late 40’s to the 60’s, ORNO’s main lighting designers were Lisa Johansson-Pape and Yki Nummi. At the turn of the 50’s and 60’s came Heikki Turunen and Svea Winkler working for the company. In the mid-60’s, Japanese lighting designer Motoko Ishii, who had become known since then, practiced at ORNO. She became famous for the lighting she designed for the German company Staff & Schwarz Leuchtenwerke GMBH. 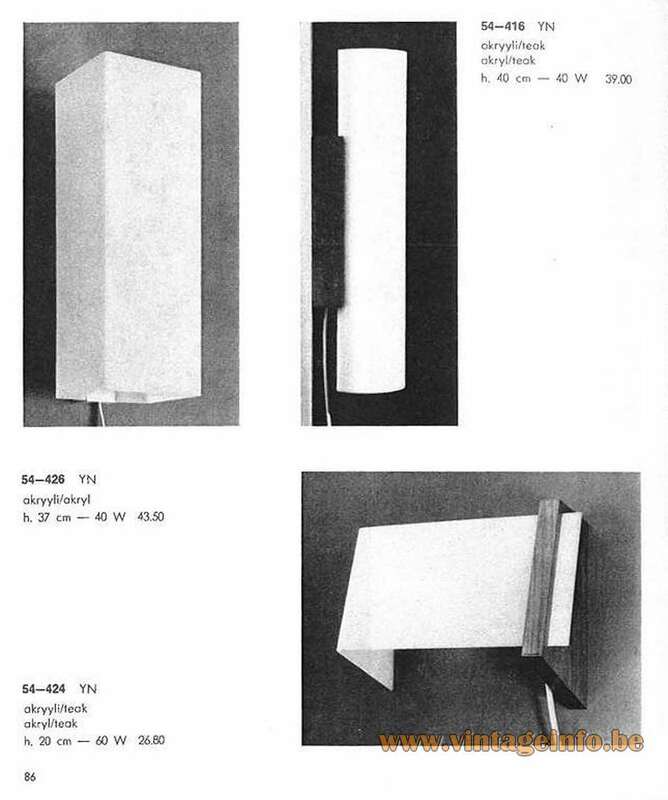 Also Tapio Wirkkala designed lamps for the company. Stockmann sold ORNO in the mid-80’s to Asea, a Swedish company, from which ORNO became the owner of Thorn-Em, England. The name changed in Thorn-ORNO. The factory closed its business in 2001, but Thorn still exists. Thorn is now part of the German Zumtobel Group. You can find many catalogues of Stockman ORNO on Vintageinfo. Some ORNO lighting is currently manufactured by at least Keraplast Oy and Innojok Oy (2017). The sockets were made by the VLM Components company from Buccinasco, near Milan in Italy. They were produced in the 1960s and early 1970s. Today VLM Components is owned By Relco. Together they are one of the biggest suppliers of switches, cords and plugs in Europe. 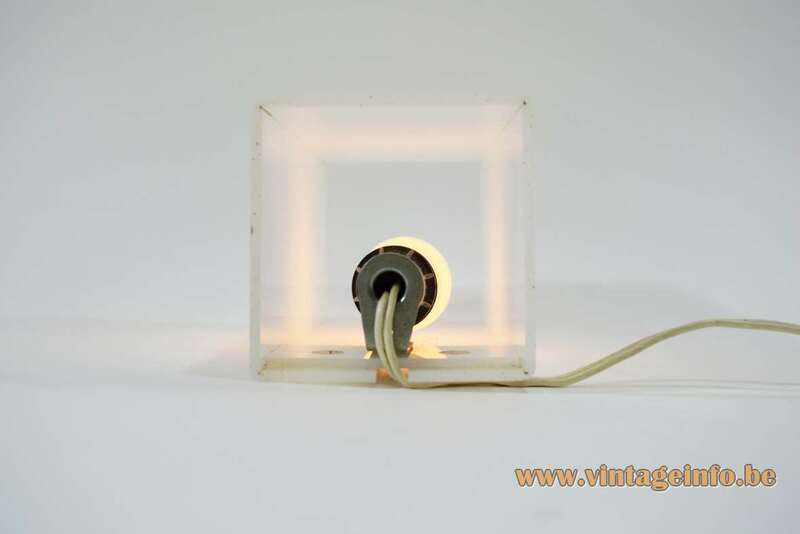 VLM Components became famous for the switches they produce that were designed by Achille Castiglioni in 1968.